A timeless wardrobe staple, our collection wide fit knee high boots will refresh your smart-casual footwear line-up. Featuring elasticated panels around the calf for increased comfort, our selection offers a range of heel heights and fabric finishes in EEE fit. 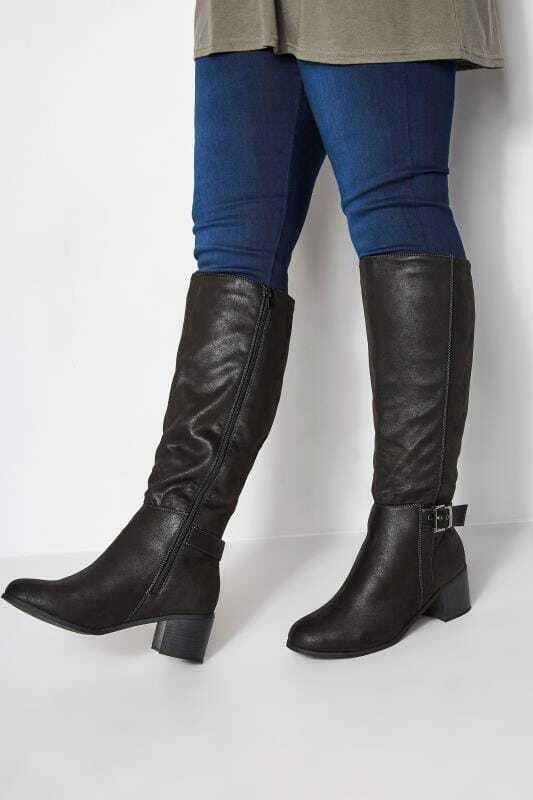 Great for off-duty days, a flat knee high boot will serve as your trans-seasonal go-to. Try teaming an over the knee style with your favourite denim, a long jersey tee and gilet for an effortlessly easy look. Want something a bit bolder? Our lace up knee high boots are great for bringing some edge to your look. Try styling with ripped jeans and an acid wash tee for biker chic vibes. Sophisticated and stylish, a heeled knee high boot can elevate your entire office get-up. Try swapping your go-to court shoes with a simple suede boot for easy style points. Great for the cooler weather, why not try styling them with thick tights and a soft knitted dress. Comfortable, cosy and chic, you’ll be the envy of the office. Notch up the evening glam with a pair of leather knee high boots. Whether you’re wearing them over black skinny jeans or with your favourite printed midi dress, our versatile collection is sure to keep you looking fabulous, no matter where you’re going. Don’t forget to add a sparkly clutch bag and a pair of sparkly earrings to finish your look!